I woke up early and took a peek out of the curtain to see a bright and cheery day awaiting for us. 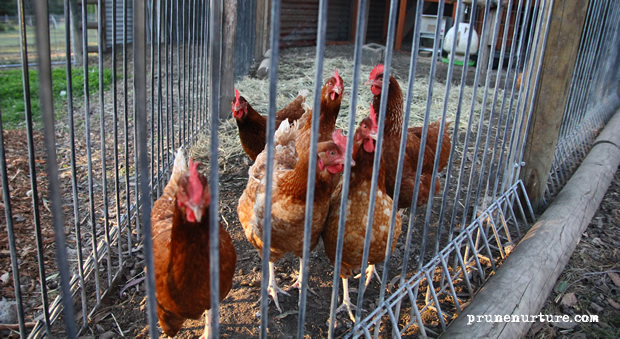 Hearing the birds chirping and the clucking of the hens filled my heart with excitement. While Dot was still dozing away on the warm and comfortable bed, Jay and I brought some of our dirty clothes to the laundry room to wash. Then we went out of the lodge to enjoy the fresh chill morning air and savouring every bit of what was before us – the big green space, the sound of nature, the animals roaming in their given space, the green and clean smell were so invigorating. 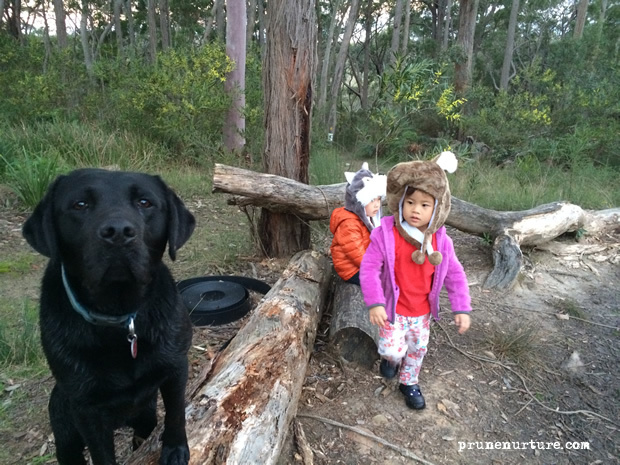 Not long after our leisure morning walk, I heard a familiar cry coming from the lodge – my girl was crying her lungs out. I quickly ran up to the room to check on her. I found her crying outside our room. The poor girl must be terrified to find herself alone in a foreign place! 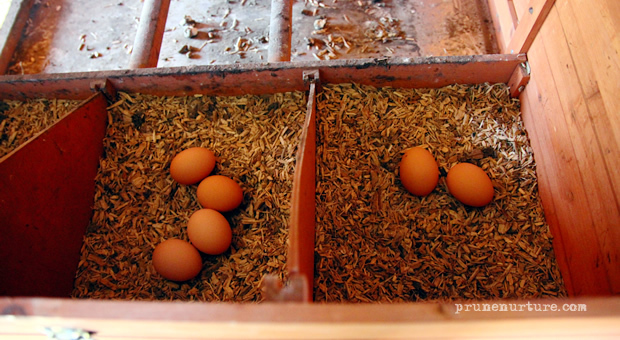 After Dot had settled down, we went to the kitchen to prepare our breakfast. 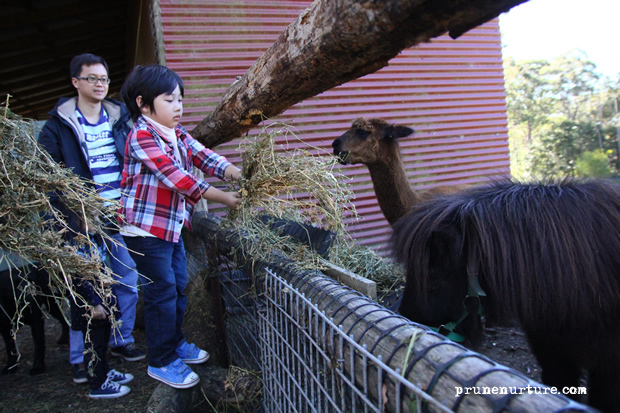 After our breakfast, we brought the children out to see the farm animals – the seven hens, an ex-racing horse, a pony named Charlie and an alpacas. 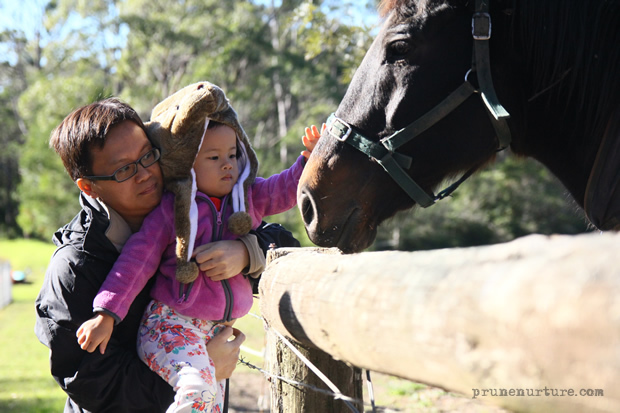 The horse belonged to another owner. After that, the fathers brought the children out for kayaking in the dam which is about 4-5m deep in the middle. The children put on the kid-size life jackets and were all ready to go into the kayak. 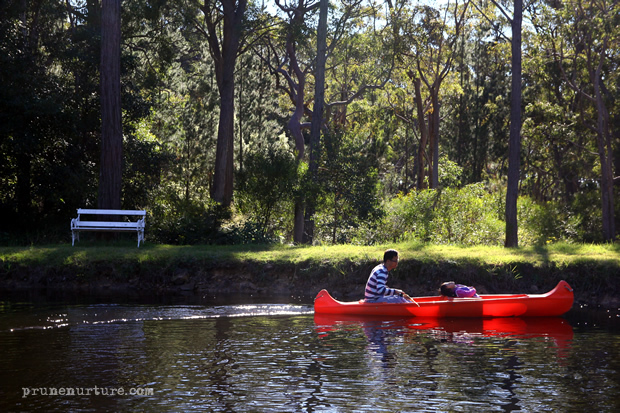 It was Dot’s first experience with kayaking and she really loved moving on the calm water. She was adventurous and courageous to even to request to sit at the front seat on her own. 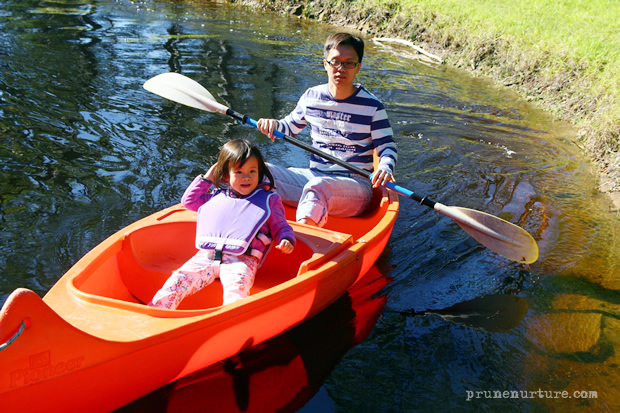 The children enjoyed being on the kayak while the fathers worked hard to keep the kayak moving. 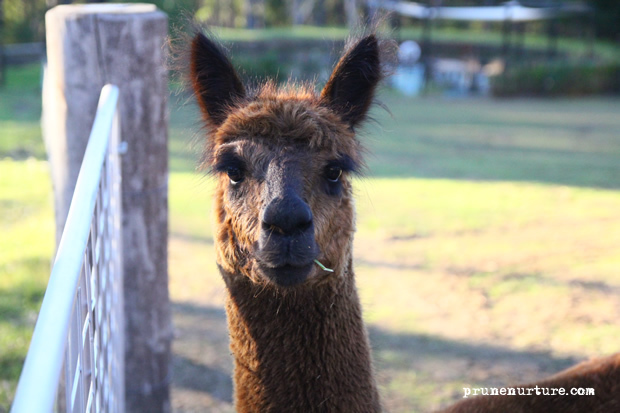 After the children had their fun time kayaking, they ran off to see the pony and alpacas. 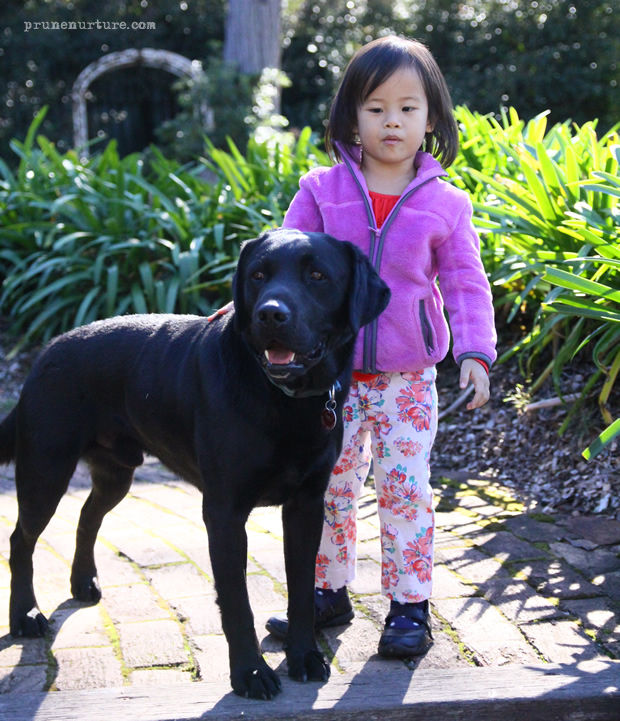 Out of nowhere, a black dog appeared and ran after the running children. The children and the adults were shocked and terrified. Later, Jay helped to keep the dog and the children calmed. Then he showed Dot how to handle the dog. Very soon Dot was running with the dog and commanding it as though she was the owner. 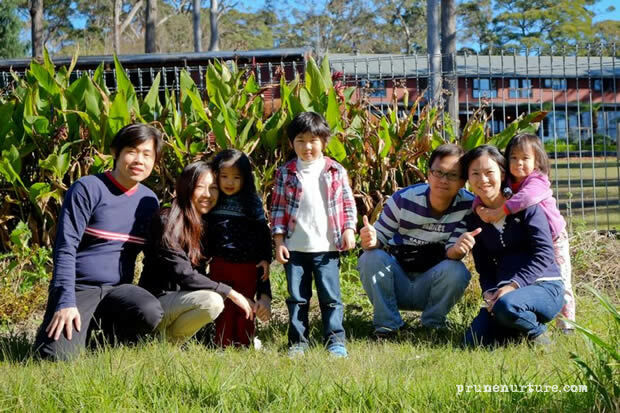 We took a group picture together near the dam before we headed back to the lodge. 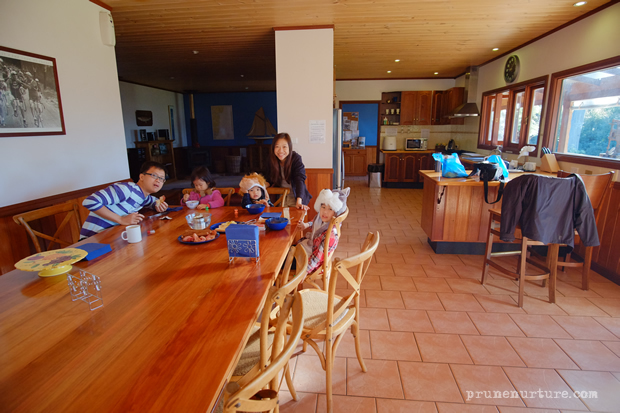 When we were at the lodge, we saw Kath, who helps to manage the lodge. Kath guided us around the farm and the children had the rare opportunity to feed the hens and also collect the fresh eggs, which we had for breakfast. 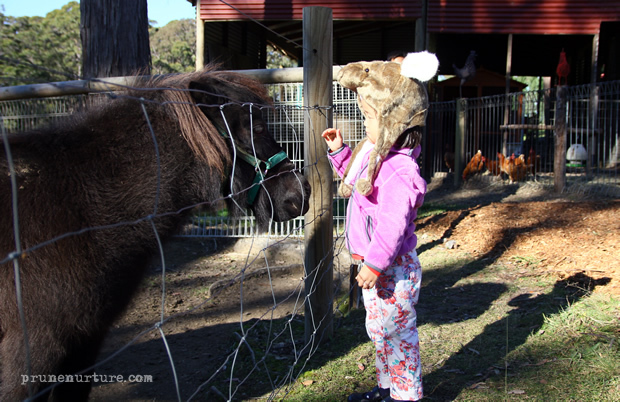 The children also fed the alpacas and the pony. 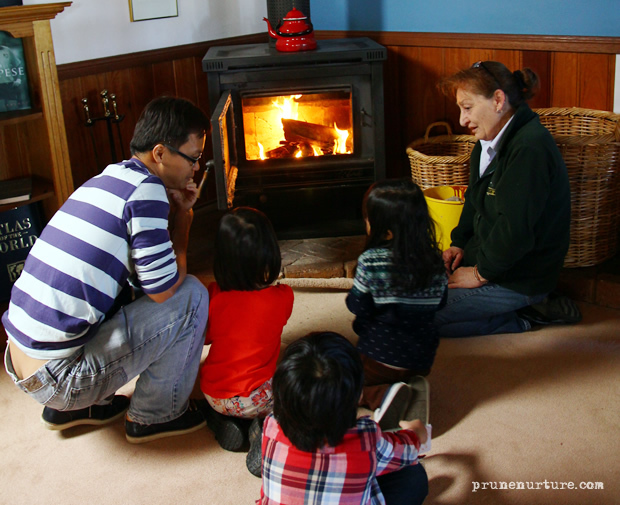 Kath also taught us how to setup the fireplace to keep the whole lodge warm, including our rooms. After learning how to setup the fireplace, it was time for lunch. 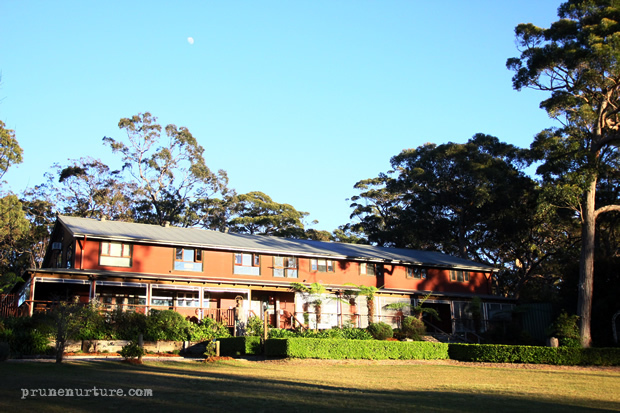 We headed for Kurrajong village centre, which was about 15 minutes drive away. There were not many choices there so we settled for burgers, chips, salad and chai latte. We bought some groceries at the supermarket and a bottle of red wine for our dinner. 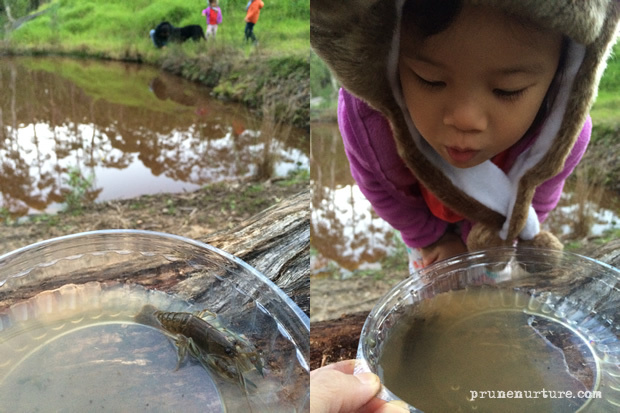 Before dinner time, Jay brought the children out to a pond to catch crayfish. In the pond, we found leftover nets in the water which was used by others. He pulled up the nets and found some baby crayfish within. Inside the nets, we saw bacon bits, which were used as baits. He caught the crayfish and put them in a small container so that the kids could have a closer look at them. Then the kids took turn to release the crayfish into the pond. The three of us had a good laugh when we realized that KL was also captured in this picture! 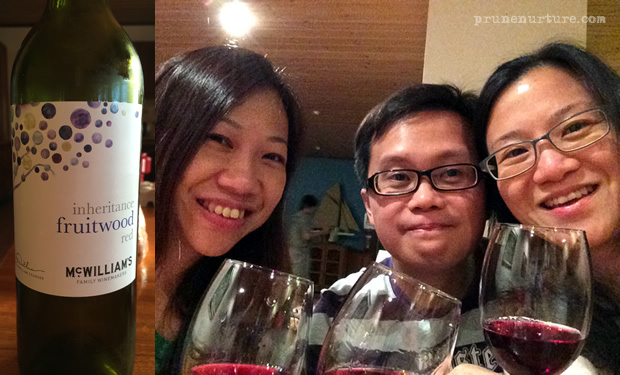 After our home-cooked dinner and putting the children to sleep, we had a good time chatting over red wine. What a great way to end our day!